This is my second post about modesty, check out the first one, Talking Modesty: Who Wears Short Shorts? The way you dress and poise yourself says a lot about how you esteem yourself. I’m all for wearing cute styles, and even throwing in an occasional trendy outfit, but modesty never goes out of style. I imagine myself as average height, but it seems nowadays clothing styles are made for women who are shorter than I am. This can be a problem when looking for casual, dressy or trendy tops. The world portrays modesty in the context of being shy, unconfident and lonely. And if we aren’t sharing the Truth about modesty, that’s the definition that will teach the upcoming generation about what to wear. Had my mom not taken the time to endure our worst shopping trips, my tears and arguments about wanting to wear certain clothing trends, I would not understand the meaning of modesty, either. This series of posts will explore fashionable options to modesty. Modesty that encourages women to be confident about who they are without the need to exploit their bodies. Modesty that allows women to show a gentleman her heart and mind before her legs or chest. A constant trend in fashion, at least for the past four or five years, has been the exposure of mid-drift, or tummy skin. But let me be clear, there is a difference between a beach cover-up and a tank top that has lost half of its fabric. I may be wrong, but I’m pretty sure the only beaches in Oklahoma are around the man-made lakes. Fashion Tip: The best test for shirts is one that has been around for decades. My Mom and I refer to it as the “hallelujah” test. If you can fully extend both hands in the air without showing skin, the shirt passes. 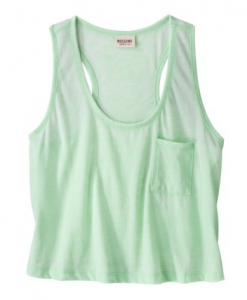 If you do not pass, find a cute cami or longer tank top to wear underneath the shirt as a layer. You can see the two separate pieces to the left. 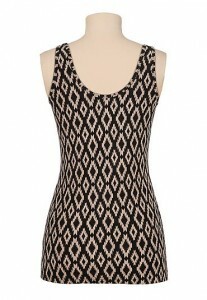 The bold print is a tank from Target. Stay away from layering more than one print. 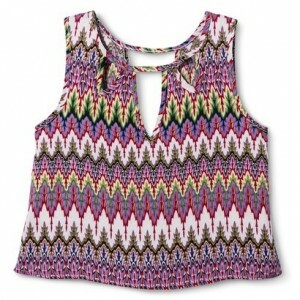 Since this top has so many colors, you can choose any one color for a solid tank top or cami. 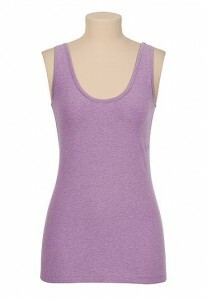 pictured is a purple tank from Maurices. When you combine the two pieces together, you get a classy but fashionable style. 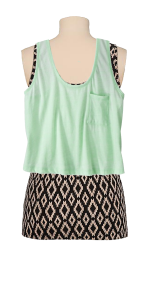 These separates come from the same two stores, but show how you can use a print underneath the cropped tank top. 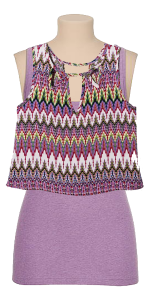 Another mix-and-match style if you do not like bold patterns is to have two solid colors. I would suggest a gray, black or white for the best match. Heart Check: Often when my Mom would tell me “No,” I wanted to know “Why?” Not because I wanted to question her authority, but because I wanted to understand what she saw that I couldn’t see. Outside of wearing a swimsuit at the pool or on the beach, I am not sure why a cropped shirt needs to be worn. Yes, I know that it gets hot in the summer, but that doesn’t mean you should walk around exposing your belly to everyone. Be confident enough to cover up. Don’t wear something just to be trendy. Think about who is looking at you. Remember that you have older men, younger men, grandfathers, fathers and even sons looking at you. Sure you might get the attention of that one cute guy at school, but if you can get his attention because of looks you won’t keep his attention for very long. Strive to make them seek out your heart, not your skin. The media glamourizes cropped tops because they want you to buy their products, products that will fade and made with cheap fabric. The Bible speaks about the beauty from within, confidence that shows through your attitude, lifestyle and countenance. Talking Modesty: Who Wears Short Shorts?